TnJ (aka The Gem King) is a man of many paths. The rapper, part-time singer (as he calls himself) and songwriter, has always promoted the notion that Christians gifted with the skill of music, have a responsibility to address a variety of issues faced by their fellow Christians & non-christians alike. 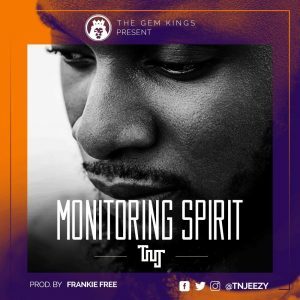 TnJ releases his first single for the year and he’s made intentional efforts to provoke a reaction from his audience by titling it “Monitoring Spirit”. The enigma of a rapper coins this well-thought-out song to address an issue he thinks has become more widespread since the advent of social media. The melodious tune (Monitoring Spirit produced by Frankie Free) emphasizes on how people close to you (or just those in your media space) tend to monitor your every move, with some of them even wishing for your downfall. TnJ wraps up the song reminding these ‘Monitoring Spirits’ that he has a God solidly behind him. The song was officially launched & performed for the first time on the 17th of March with a concert tagged: “The King’s Court”. This would be TnJ’s first ever concert and the artiste who only wanted a few people in attendance ended up with a sold out concert. The intimate music session which saw @TnJeezy share personal backstories behind some of his biggest songs, was heavily attended and graced by many fans (with some traveling in to see the show from other states).